The Park Tool WAG-4 comparatively measures the distance from the rim to end of the hub locknut on each side of the wheel. One can then accurately dish the wheel so that the rim lies in the center of the hub. This is especially difficult to eyeball on rear wheels or disc wheels where the rim does not center between the hub flanges. Compatible with 16 Inch to 29 Inch wheels (ISO 305 to 630). Can even be used with tires still mounted. Made in the USA. Its a simple tool - easy to adjust for any diameter rim. Make sure you dish your custom build correctly. Takes the guess work out of it. Even my Park TS 2.2 truing stand is not exact. I have used many different wheel alignment gauges through almost 20 years of working in shops. 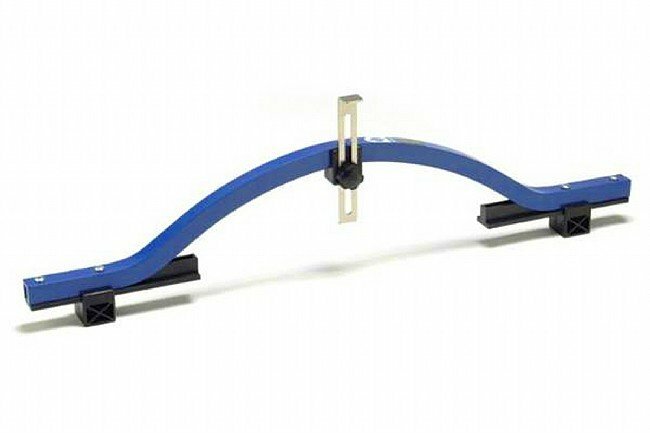 This type is easy to use with the sliding center axle gauge, and will work well even with the tires mounted! I have used some with a screw type gauge, (Campy) but this is faster and easier! Also, to not have to take the tire off in order to get a precise alignment is a plus! Quality by Park. I only purchase higher priced tools, because over the years the extra enjoyment of using them and the precision I am able to get more than pay for the few extra dollars I spend. Of course, I bought this on sale from Bike Tires Direct, so the price was competitive. I added it to a Continental tire order to get an extra discount.